4 stars. I am looking forward to reading the second book! I'm hoping for more "pirate stuff", especially concerning Alosa's father, more swoon (kissing! more kissing! ), and more sticky situations for Alosa to clever wriggle out of. Levenseller is an author whose books I will be keeping an eye out for in the future! It's because of Peter Pan and Captain Jack Sparrow that I love pirates! And this definitely sounds like a great read. Awesome review! Right?! We grew up with pirates in our lives! This story was really good. Thank you! This looks AMAZING! Great review, glad you loved it! I adore swoony banter and pirates, so this is definitely a book for me. I NEED IT! Right?! 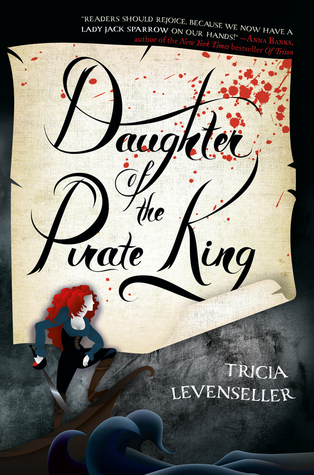 This book had me at pirates, honestly! It's always a good thing when the only dislike you can list is that you wish it were longer!! :D I'm glad to hear you enjoyed this one, Alyssa! I'm really looking forward to reading it! I kept trying to turn pages but the ARC had no more! Very disappointing, LOL. I hope you enjoy this book, Becky! OOoh nice! I've been trying to be good this year and not add a whole lot to my TBR pile (LOL!)! But this one was definitely catching my eye, because PIRATES!! Glad to hear it was an amazing debut! I might just be buying this one right away too! LOL! Great review! Girl, I feel you! There are just so many great books that have published recently and will be publishing. This one is pretty unique and fun because, as you said, pirates. :D I hope you enjoy it if you read it, Jessica! Yes, definitely need more romance in the sequel! I can't wait to see Alosa in action, on her own ship. I like the sound of this one. Pirates are always a win and I haven't read too many pirate stories for some reason. I am glad you enjoyed this one. Great review! I agree! There have not been many YA stories featuring pirates. Thank you, Carole! I am so glad to hear this delivers everything a pirate book should deliver. 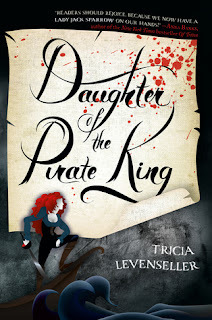 YA needs more pirate books so I am super excited to read this one! RIGHT?! I would have been so sad if this book was disappointing. I hope you enjoy this one when you get the chance to read it, Teresa! I'm glad that you ended up liking this one! I loooooved it so much! I can't wait for the sequel! I need more lady pirate badassery in my life! This book sounds like so much fun. I have recently been reading some heavy books, and this sounds like the perfect break from those. You definitely convinced me to add this to my goodreads TBR. :)I love that banter and tension are two big aspects of their budding relationship. It sounds perfect for me. Plus, it is a big pro that they don't immediately fall in love with each other. Amazing review, Alyssa! Have a great rest of your week! Girl, this is something I think you would LOVE! I really hope you read it because it is so fun and entertaining, and I am so sure you'd like it. Please let me know if/when you do! Oh nice!I recently found out about this and have been wondering about it -- loving the banter and the slow burn to build everything up properly! Yes! Somehow you subconsciously anticipate the book being AWESOME. And this one was. I hope you enjoy it if/when you get the chance to read it, Danya! This one sounds very interesting. I like that you have a bit of humor mixed in with some suspense. It sounds like the author did a great job developing the characters as well! Great review! The humor was really well-written! It wasn't overwhelming, but it made the book so much more fun to read. Thanks for sharing. This does sound like a fun one. The two main characters sound great, and I'm glad that the romance isn't unrealistic or occur too fast! I have this one on my kindle right now! I'm so excited to read it and I'm glad to hear you liked it so much! I've heard so many good things about it one, I'm really looking forward to all the pirate adventures! I agree, if you mention pirates in a book, I expect swashbuckling adventure, and I so also pleased! So glad you enjoyed this book :D Lovely review, thank you for sharing! Excellent, I'm glad you liked it as well! Hopefully we are blown away by book two. Thank YOU, Brittany! This book is already on out TBR - your review just meant it stays there. Fantastic review! it's been a while since we've read a pirate themed book, it'll be exciting to come back to that sort of world. I'm so freaking happy that the characters aren't in the I love you stage. I always think how a YA book should stick to the I like you stage with developing feelings. It's refreshing to know there's a book that's like that! Got me even more excited for this book. Yes great review Alyssa now I really want too check out this book when it comes out, I absolutely love books with pirates in them as well. Plus this one really looks and sounds right up my ally too! Thank you so much for your awesome post my friend. I LOVE pirates, but I haven't read enough books about them. I've seen many positives reviews about this book. I can't wait to read it. It sounds like such a fun read. This one is now firmly set on my TBR after reading this review. It's one I didn't really know too much about (until now) and it sounds like exactly the sort of read I will enjoy. I can't wait to get my hands on this one now! I think you would really like this book, Di! It has a certain adventure feel to it that appeals to me and I think you like those types as well. I absolutely LOVED this book! Alosa was awesome and made me laugh out loud! She was hilarious!Thank you for recommending it! Can't wait for Book 2. The world building wasn't detailed but it was definitely super entertaining! I hope it's just a duology! Gets tiring waiting for years for a book series to end. Thanks again for a spot-on review!